Tallahassee, FL — Florida State Senator José Javier Rodríguez introduced Senate Bill 84 (SB 84) to protect LGBTQ youth from receiving conversion therapy, which falsely claims to be able to change people’s sexual orientation and gender identity, from licensed mental health practitioners, on November 21, 2018. 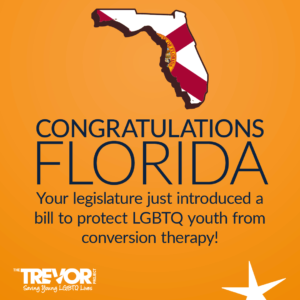 With SB 84, Florida becomes the first state to introduce legislation to end conversion therapy in the 2019 legislative session. Equality Florida applauds José Javier Rodríguez for filing this critical legislation that would protect young people from this fraudulent practice. The Trevor Project works with national partners such as the National Center for Lesbian Rights (NCLR) and the Human Rights Campaign (HRC) as well as state leaders like Equality Florida to end conversion therapy. 34 states have historically introduced legislation to protect youth from conversion therapy; 14 states have signed them into law. Conversion therapy is widely opposed by prominent professional health associations including the American Medical Association, the American Psychological Association, and the American Academy of Pediatrics. People can sign up to join The Trevor Project’s effort to end conversion therapy by texting “TREVOR” to 40649.